Knight’s Torque Tubes series is designed to reduce operator fatigue by absorbing torque reaction produced by assembly tools while balancing the tool weight. 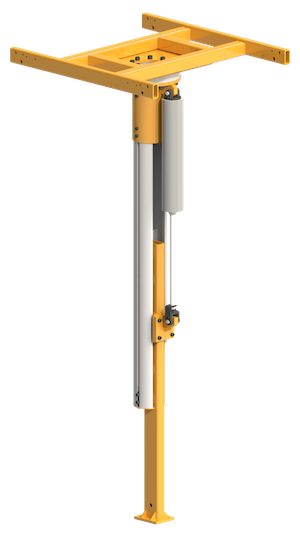 The Torque Tubes are balanced by an air cylinder to achieve zero gravity balancing. 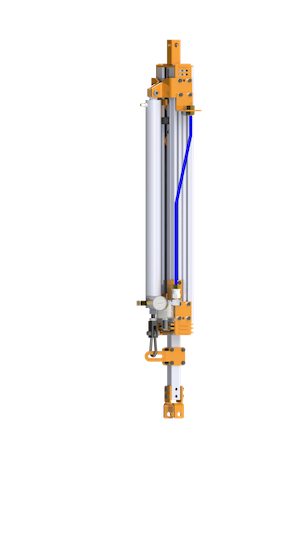 Each pneumatic cylinder is supplied with single balance control. The ATA2600AR and ATA2700AR can be swivel Tool Holders by incorporating our ASA9518 360 degree Rotating Tool Clamp. They can also be a fixed Tool Holder by incorporating our ASA9500 or ASA9501 Adjustable Tool Clamps. The ATA4500 is intended for high torque applications. Custom tool holders will need to be designed for each application. Balanced by an Air Cylinder. Available Strokes: 12 in. [304.8mm] – 36 in. [914.4mm]. Standard Max. Travel: 24 in. [609.6mm]. Max. Torque: Up to 150 ft-lb. [203 Nm]. Max. Balancing Capacity: Up to 35 lbs. [15kg]. Product Weight: 37.1 lbs. [16.8kg]. Modular design allows for accessories to be mounted to the body. Max. Torque: Up to 300 ft-lb. [406 Nm]. Max. Balancing Capacity: Up to 135 lbs. [61.2kg]. Product Weight: 55 lbs. [24.9kg]. Max Vertical Travel: Varies Per Application. Vertical Rail Lengths: Up to 15 ft. [4.57m]. Uses a 4 in. [101.6mm] Bore Cylinder. Max Torque: Up tp 853 ft-lb. [1,156 Nm]. Max. Balancing Capacity: Up to 500 lbs. at 100 psi [6.8bar].